Although I don’t always find time or energy to write, it is always on my mind. Sometimes it’s recognizing that I’m just too exhausted from staring at a computer screen already for ten hours to sit down and stair at it more. Often it is the block of having hit a section of dialog or description and not knowing exactly how to take the story next. Yet just as often it is a combined frustration of not having energy and not sure I know what I am doing that causes me to not try, and it circles back as frustration that I didn’t even try. I’ll go days, weeks, months without writing until I just finally do. I’m back into the writing mood. Can I get a hallelujah? Many reasons for that, some of which are due to technology. I’ve found a few apps for the iPhone that are becoming like best friends. I’ll share those here. One of my biggest hurdles when I am writing is my memory. I come up with ideas but if I don’t archive them at least with a brief description and don’t think about them everyday between my writing episodes I’ll lose most if not all of the idea. In the past I took to carrying a notebook with me everywhere. But then I’d forget the notebook and pick up another one and before you knew it I had ten notebooks and I was frantically searching them all for the one page I knew i had written the name for my new characters. Frustrating? Umm yeah. 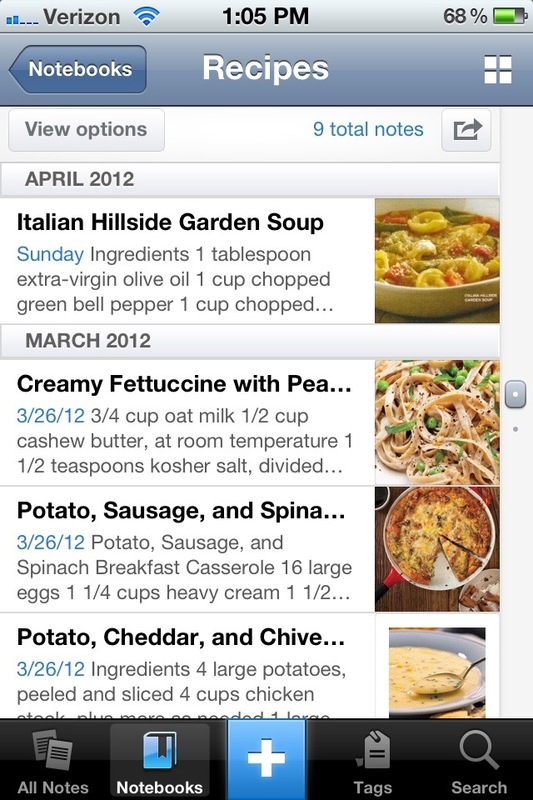 Flash forward and now I have an iPhone and I’ve found Evernote. 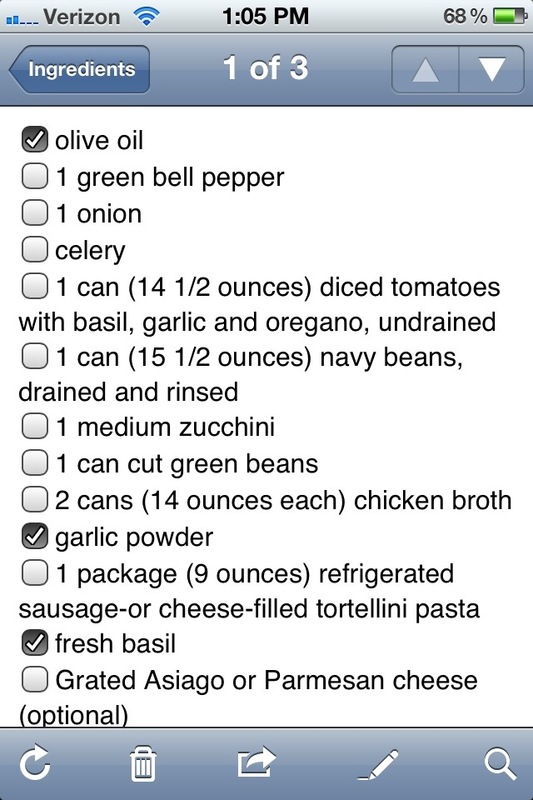 Evernote can be used for many things, and I do use it for more than just writing – like recipes and shopping lists for those same recipes. The main selling features are that it is free and it syncs. 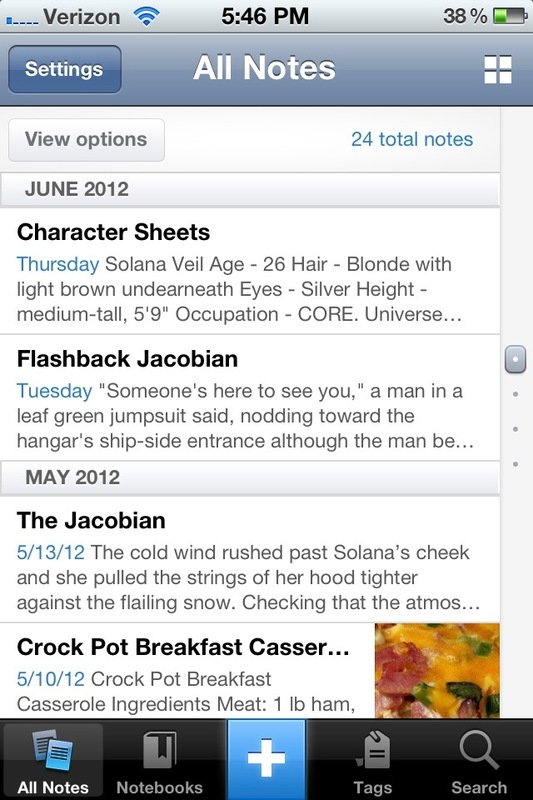 It has a desktop program that you can use when you are at you computer “clipping” ideas from the web or opening new notes to jot down creativity spurts. The clipper lets you grab pictures from the web also, so for example my recipies have a nice image of what it should look like. You can attach files as well as pictures to each of your notes and organize them in labeled notebooks that you come up with. So if you write a chapter at your home computer and then find yourself at a local park suddenly inspired and wishing you had that chapter with you so you could continue, you’d actually have it synced right there in your iPhone. Then once you type your edits out and about and find yourself back at your home computer everything is already updated. I find it fantastic! I can write for ten minutes here or there with no need to carry a paper notebook, have a printed copy of my story, or be sitting in front of my home computer. I find it great for work- take a 15 minute break and type just a tiny bit. Before I know it I’ve got a few paragraphs and those really add up when you usually don’t write. I’ll share a few pictures below. Another tool I’ve found is WordOne. Now the free version only let’s you track one project, but for now that is fine for me. I’ve been saying I need to just write ten minutes a day and if I write more then it will be great. But if I write one day a week like I have been doing that really doesn’t add up. I’m doing better with the Evernote app I wrote about above, but this helps as well. It lets me set a goal of how many words I want the project to be, a date to complete it, then it tells me how many words a day I’d need to write to reach that goal. 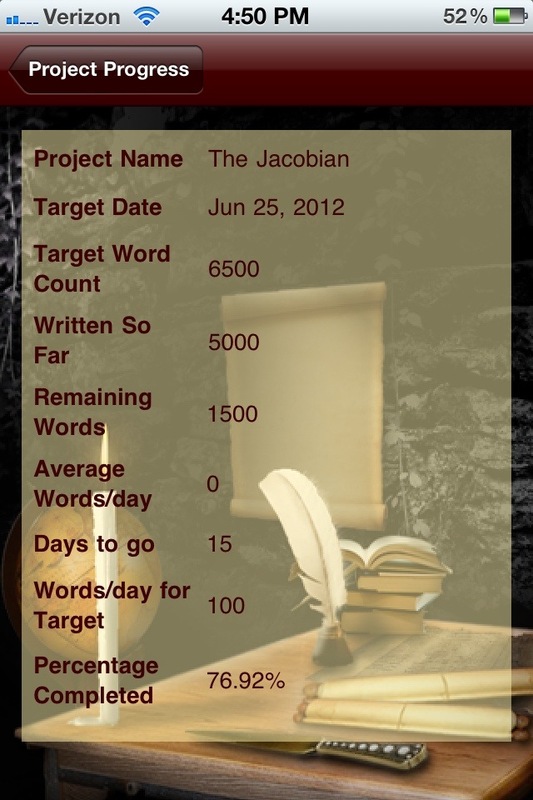 It will also let me put how much I wrote for the day so I can see exactly how the progress is going. When I see a bar that says 75% complete it oddly gets me motivated. An image below for this. 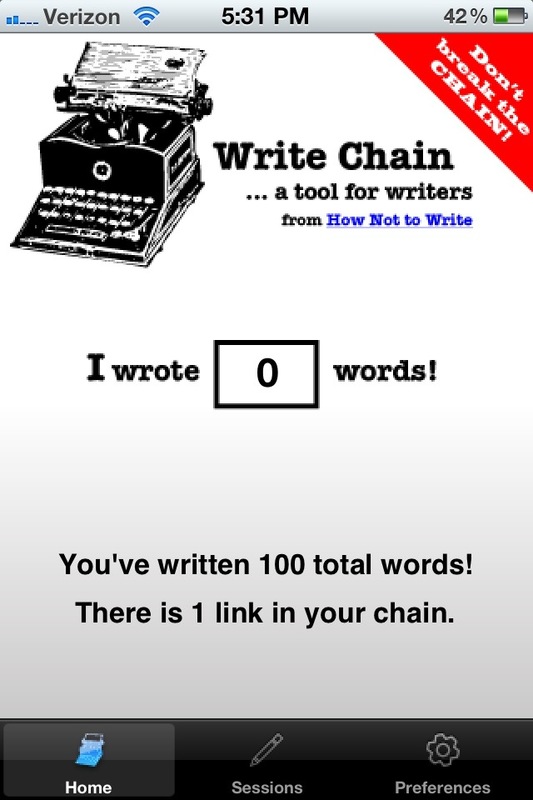 The third app is WriteChain. A fun way stay motivated to write every day. You set how many words you will write each day and how many days can pass without that before the “chain” will break. I’m using this to help meet my daily writing goal from WordOne. I can’t edit for you to read it lol!